As you may have gathered (because you are reading this…) we have launched our brand-new website! Be the first to read about our updates in this ‘News’ section. You can keep updated on the latest developments here at Monolith HQ and within our industry. You will find all the latest information on our innovative and cost effective BrickPlus & StonePlus products. The website will be the first place where you can learn about our new products – like the recently released BrickPlus: Pro, our new brick slip product with a mesh integrated inside the slips to create a panel of twelve bricks. Rapid installation, reduced labour and reduced costs are amongst many other advantages that this ‘first in the construction market’ product provides. If you have a project pending and have questions about our products, take a look at our ‘Frequently Asked Questions’ section. If you don’t find what you are looking for, just call us and we will be happy to help. Visit the ‘Case Studies’ section to view a series of reference projects we’ve been involved with, ranging from interior retail store design to a 350-bedroom student accommodation block and even several luxurious residential properties. 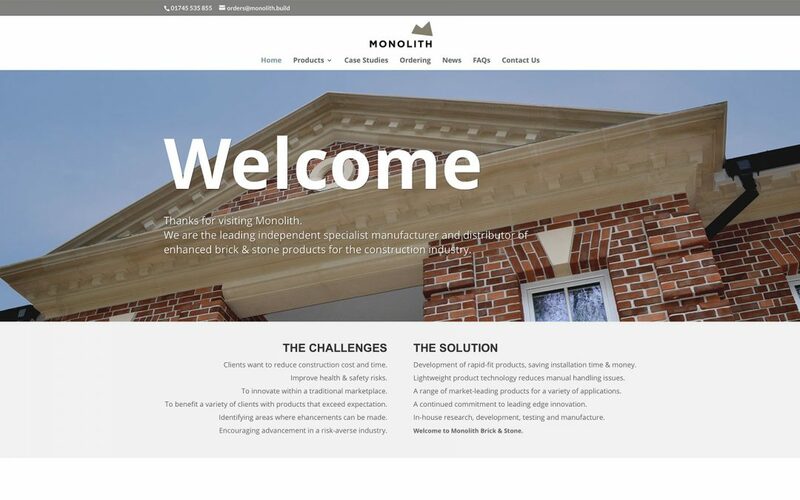 Naturally, we’ve also included information on our ‘Customer Ordering Process’ – the easy way to start using Monolith products for your next build. Moving forward, the new Monolith website will evolve and grow into a reflection of our key core objectives: Creation, Transformation and Restoration. Over the course of the last calendar year, we have undergone a slow but steady transformation. We have a fresh, new management team in place. Having listened to customer feedback, we’ve made significant improvements and worked hard to streamline our operation. Our ethos and attention has focused on outputting high quality, innovative products coupled with an improved level of customer care. We are committed to making your experience with Monolith outstanding, as we want to continue to cultivate long lasting relationships with innovative and forward-thinking clients. Please feel free to call us on 01745 535 855. We’re more than happy to discuss how the Monolith range of products can benefit you and your next idea!